Description Idaho National Laboratory has benchtop platforms for microfiltration (MF) and ultrafiltration (UF) systems of organic/aqueous solvent systems which also include solids separations of larger suspended particulates ranging from submicron to millimeter sizes. Our systems can 1) address feed streams containing large amounts of particulate materials (slurries of 2-10wt%), 2) include the capacity of filtering aggressive organic solvents along with acidic or basic solutions, 3) test system as temperatures up to 80°C and 4) allow researchers to test a variety filtration media such as polymer, ceramic and metal membranes. In addition, these systems are able to analyze cell designs from small coupons to large surface area membrane modules (square meters), including a number of flat sheet, spiral wound, tubular, hollow fiber module designs. Numerous pumps and other equipment are readily available that are readily configured for use with out filtration systems. Unique aspects Idaho National Laboratory’s Filtration and Process Analysis capabilities are unique to the national laboratory system in its breadth and dynamic selection of analytical tools. 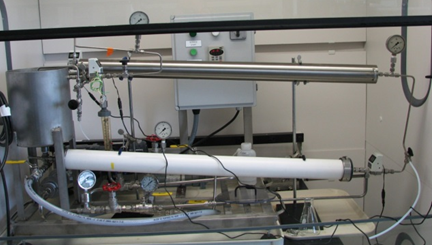 The researchers are experienced in applying the unique instrumentation in the areas of membrane based water treatment. Availability The Filtration and Process Analysis is capability within Idaho National Laboratory’s Biological and Chemical Processing group and is available to a resource both within INL and to collaborators from outside organizations. Removal of trace organics with two filtration modules (membrane area, 1.4 m2) to treat an organic/aqueous solution (<3wt% composition).